What if you could have Bose® sound with breakthrough simplicity? You can. Introducing the new Bose® Lifestyle® T20 home theater system. The Bose® Lifestyle® T20 home theater system brings premium performance to your movies, sports and video games—with simplicity like never before. Easy to set up, the Lifestyle® T20 system lets you connect up to 6 HD sources—such as your Blu-ray Disc™ player, cable box and gaming system. 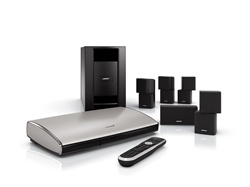 It's engineered with exclusive Bose Unify™ technology, which guides you through the setup process. The system shows you the best connection and which input to use. It even verifies the connections you make, so you can be confident you've set it up correctly. Bose Unify™ technology makes using and controlling your sources simple, too. Clear, on-screen menus provide all the information you need for the sources you've connected. So you spend less time trying to figure it all out and more time enjoying it. The Lifestyle® T20 system includes a Bose® universal remote control that simplifies the programming process. There’s no need to input any codes. Just aim the source remote at the control console and follow the onscreen instructions. With just a few button presses, it identifies almost any source and programs the remote to control it. The remote is also backlit for ease of use, day or night. The system also features ADAPTiQ® technology to analyze and adjust the system's sound to the size and shape of your room. This allows greater freedom of speaker placement and ensures consistent, high quality performance. Exhilarating sound is delivered from Direct/Reflecting® speaker arrays which blend in elegantly with your décor. And an Acoustimass® module adds the deep, emotional intensity you feel at the theater, while hidden out of sight. This combination fills your room with detailed sound and dramatic sweeping effects that will make the most of your movies, sports and games. This unique combination of premium performance and breakthrough simplicity is available only from Bose. Bring more enjoyment to your home entertainment with the Bose® Lifestyle® T20 home theater system.